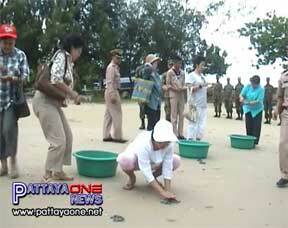 Turtle Release ceremony at the Sattahip Navy Base. On Tuesday Morning at the Marine Conservation Center located inside the Sattahip Navy Base, the Navy Wives Association of Thailand led by Khun Duangpong paid a visit to the center to take part in a turtle release ceremony on the beach whereby 30 baby turtles were released into the sea as part of the centers efforts to increase the local turtle population. Rear Admiral Jackashai is in-charge of the center and told us that the shells of turtles are often used in ornaments and the Vice-Admiral would like this practice to stop, however the value of such items will ensure that the use of the shells will continue. Bangkok News, Tuesday June 2nd, 2009. Mystery of Satahip Skeletons Solved. 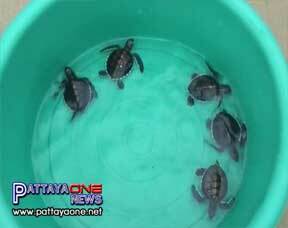 After having spent the allocated Seven million baht, the government has found that the 'skeletons' found in and around Satahip were, in fact, turtles. The relatives of the missing persons from 30 years ago have been notified and are satisfied with the government's findings.